I’m very excited to release this recipe today! 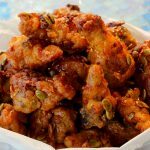 My previous Korean fried chicken recipes have been loved by my readers and their friends and families for years. Now I’m sure many people will love this recipe, too. Last year I visited Korea and found so many of my fellow Koreans were crazy about honey butter flavored potato chips. I tasted them I liked them, even though I’m usually not a fan of butter. They were addicting! The company that makes honey butter chips is building a new factory to meet Koreans’ demand, and in the meantime there’s a shortage. It’s became a craze in Korea to give almost any kind of snack a honey butter flavor. When I got back home to New York, I thought I could make something crunchy and sweet with a honey butter flavor, and I started experimenting with fried chicken. It took a lot of experiments until I was satisfied with the result. 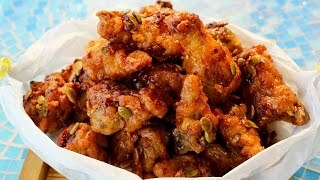 It’s small pieces of crunchy sweet chicken with garlic, honey, butter flavor. So yummy! No wonder so many Koreans love this taste! It’s hard to stop eating them once you start! And this recipe is non-spicy, so everyone can enjoy it. Like my other Korean fried chicken recipes, we need to double fry the chicken to make it extra crispy, flavorful, and light. Put the chicken in a bowl and mix with salt and ground black pepper. Crack the eggs into the bowl and add starch, flour, and baking powder. Heat up a 12 inch skillet with the cooking oil over high heat for 5- to 7 minutes until it reaches 350° F. You can dip a tip of chicken into the hot oil to see if it is right temperature or not. If several bubbles come up, it’s time to fry. Put all the chicken pieces into the hot oil one by one. Let cook for about 5 minutes until the bottoms of the chicken turn a little crunchy. Then flip them over with tongs, splitting up any pieces that have fused together. Let cook another 5 minutes and then turn them all over. Keep frying and occasionally turning over for another 10 minutes until all sides are nice and crunchy. Transfer the crunchy chicken one by one into a strainer over a stainless steel bowl. Let the oil heat up for 1 minute and then put all the chicken back in. Cook for 7 to 8 minutes until all sides are crunchy and look golden brown. Strain the chicken and turn off the heat. Heat up a large skillet for a couple of minutes. Add butter and garlic and stir it up until the garlic turns fragrant and a little crispy. Add soy sauce, sugar and stir until well melted. Add honey and stir. Keep stirring until it bubbles vigorously. Add the chicken and the pumpkin seeds (if used). Mix and stir well to coat evenly. Serve right away or let cool to serve later. Posted on Monday, October 17th, 2016 at 6:35 pm. Last updated on June 2, 2018. Posted February 20th, 2019 at 12:20 pm | Log in to reply. Hi! How do I make it a little spicy and a little sweet? This recipe was originally posted on October 17, 2016 at 6:35 pm by Maangchi. It was last updated on June 2, 2018. The video was watched 3,921,206 times on YouTube & has 85,608 likes!